Beauty Blogger Headquarters May Task Beautiful Collections! 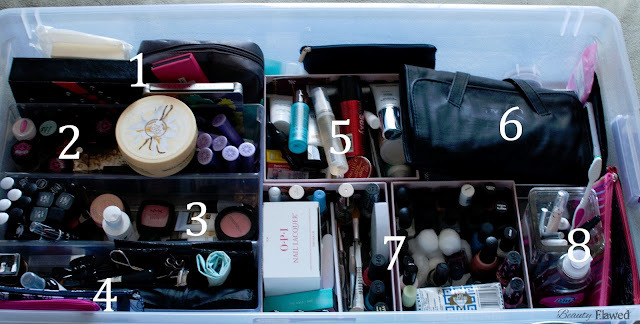 This month I'm doing the Beauty Blogger Headquarters task which is all about the collection behind the blog! Let me run you all threw the areas of this chaos real quick. 2. Various pigments and eye products as well as stuff that wont fit elsewhere, hence the lotion. Where do you keep your collection? What furniture or organizers do you use? I'm glad you asked! I'm actually in the process of putting together my own vanity type area in my bedroom to help contain the beast collection. I ordered this desk from Target over the weekend (and I'm actually waiting for the UPS guy to get here with it as I write this) and I'm thinking about picking up an ALEX or two from Ikea to go along with it. I also ordered this new makeup mirror from Amazon that I'm hoping will be the right height. I'll post a picture of it all when it's finished. Do you have a cataloging system? If so, can you share your secret? Not unless you consider organized chaos a system :) I know where everything is but if I had to ask someone else to find something it would take awhile I'm sure. Do you have any special displays for your favorite items? Not so much a display but all my favorites or things I use daily go into the three makeup bags below. What are your top 5 FAVORITE items in your beautiful collection? That would have to be my MUFE HD Foundation The Balm Hot Mama Blush, Shu Eumaru eye lash curler, OCC Lip Tar in Pretty Boy, and my X eye shadow from my UD custom pallet. If you want to see more collection from other bloggers check out the lovely ladies below! That desk at Target looks so nice! I might have to get one. I have an Alex 9-drawer unit, so nice, well worth the money and construction :)Thanks so much for joining BBHQ this month! My pleasure it was a fun post to put together. I'll look out for next months task. This makes me want to organize my collection! !